Description: A tall Tamarack Pine tree designed with natural rustic charm adorns this handsome wall sconce while the brilliant afternoon sun shines over the woodlands. 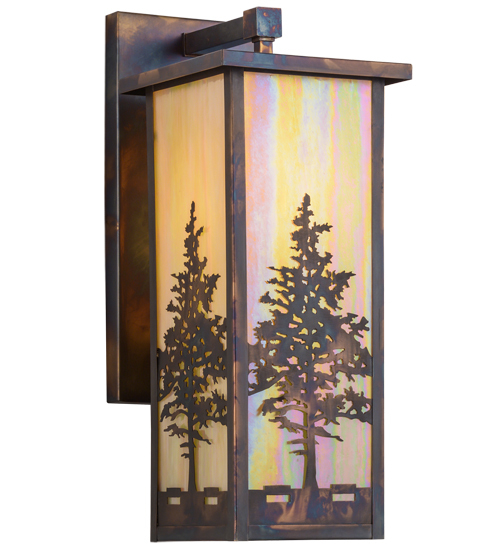 Beautiful ambient light is achieved through stunning Beige Iridescent art glass, which is enhanced with metal hardware and decorative accents featured in a Dark Burnished Antique Brass finish. This sconce is handcrafted by Meyda artisans in our Yorkville, NY facility, at the foothills of the glorious Adirondack Mountains. Custom styles, sizes and colors are available, as well as dimmable energy efficient lamping options.